It’s been a little more than four months since Hurricane Matthew hit North Carolina with historic flooding, and parts of the state remain in devastation. Property damage estimates hover around $2 billion, and NC Governor Roy Cooper recently put the number of families still without permanent housing at more than a thousand. Businesses and community infrastructure took big hits as well, with environmental concerns related to historic-level flooding a persistent problem that some estimate may take years to correct. In short: recovery is far from complete. 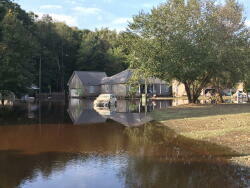 The North Carolina Community Foundation Disaster Relief Fund is still at work. NCCF just completed our first round of grants and continues efforts to grow the fund. Because NCCF’s Disaster Relief Fund focuses on unmet needs in communities hit hard by calamity, the story is not over for us. 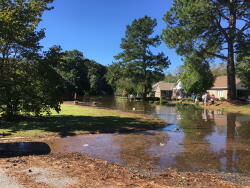 “There are many organizations that focus on immediate needs, and we also made grants in communities hit by Matthew and flooding where these needs weren’t being met,” said NCCF Grants Director Leslie Ann Jackson. Grants to help re-stock food pantries and to organizations providing cleaning supplies and furniture are examples. But because NCCF’s Disaster Relief Fund primarily takes a longer-term focus, many nonprofit organizations serving storm victims don’t yet know what unmet needs will still exist. State and federal dollars are still going out, Jackson noted. “We’ve hit a transition period, in which we we are still learning what community needs remain,” she said. Tolle Whiteside said that NCCF especially wanted to acknowledge the generosity of the Tides Foundation, on recommendation of the Google Foundation; AT&T; F.N.B. Corporation, which recently purchased Yadkin Bank; the Humana Foundation; the Oak Foundation; and several individual donors and family foundations that wish to remain anonymous. Of those gifts, more than $300,000 has been allocated for distribution to 20 NCCF affiliates serving eastern North Carolina counties hardest hit, as well as to counties where we don’t operate affiliates, including Cumberland and Sampson. One aspect of NCCF’s Disaster Relief Fund that many donors said has moved them to make a contribution to NCCF was the fact that the Foundation charges no administration fees for this fund. NCCF will issue another round of local grants to affected areas through the affiliate foundation network. The Foundation also will fund initiatives that have a larger reach throughout eastern counties still being affected by Matthew and subsequent flooding. The timing of this second round of grants is especially crucial to meet unmet needs still in process of being identified, said Sally Migliore, director of community leadership. NCCF also wants to thank Duke Energy for issuing a challenge match to grow the NCCF Disaster Relief Fund to help meet the long-term needs of our state. The 90-day challenge was issued Jan. 24, with monies donated to NCCF’s Disaster Relief Fund matched up to a total gift of $50,000. To participate and learn more about the challenge match, visit this page. Jackson acknowledged the agility of the statewide grants committee, which has helped to provide leadership throughout the granting process. “This group has been very responsive to the needs of our state’s citizens and to the needs of our organization so we could effectively respond,” she said. Migliore said the affiliate boards in the affected areas have also been very responsive. “We have really seen the value of the affiliate network as we have relied on the advisory boards’ local knowledge and expertise to help marshal these disaster relief grants where they are most needed,” she said. “This is what community foundations do,” said Tolle Whiteside.